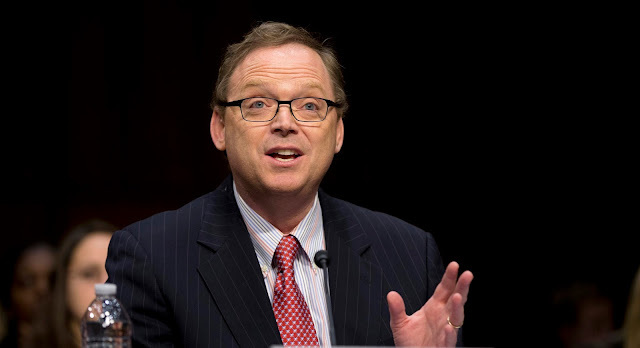 Newly confirmed Council of Economic Advisers Chairman Kevin Hassett is scheduled to give a major speech on Thursday. His first as chairman of the CEA. The Tax Policy Center, a joint project of the left-leaning Brookings Institution and the Urban Institute, just released an early analysis of Trump's tax reform. [The Reform will] reduce federal revenues by $2.4 trillion over the first ten years and $3.2 trillion over the subsequent decade. Thus, a big jump in the deficit, since there is no focus by Trump in cutting net Federal government spending (It will go up.). He is going to use as ammo, the notion that tax loopholes will be closed--to prevent the deficit from exploding. He also plans to tell the Laffer Curve joke. Of course, the D.C. establishment is stepping up now to derail any reduction in loopholes (and good for them, loopholes, as Mises said, allow the economy to breathe) and I suspect McConnell and Ryan, part of the "Big Six" that created the Reform package, have booby-trapped the package anyway. As for the Laffer Curve joke, I plan to discuss that on this Sunday's edition of Sunday Morning with Robert Wenzel. The Laffer Curve is a joke and much worse than most understand. Any time you hear some Politico talk about how much the deficit will fall over a ten year period or some-such nonsense, change the channel. No Congress can obligate a future Congress to spend a penny on anything.